This tool is displayed after you select any of the menu items of the File → Folder submenu. You may need to enable the File → Folder submenu by checking "Enable the 'File|Folder' Submenu" in Options → Preferences, General|Features section. Tightly integrated in XMLmind XML Editor. Does not use much screen real estate. Makes use of all XXE plug-ins. For example, if you install the "JEuclid image toolkit plug-in" add-on, you'll be able to preview MathML equations. Last but not least, if you have the "WebDAV virtual drive plug-in" add-on and/or the "FTP virtual drive plug-in" add-on installed, you'll be able to manage files stored on all sorts of remote servers. Installing such add-ons is done simply by using Options → Install Add-ons. 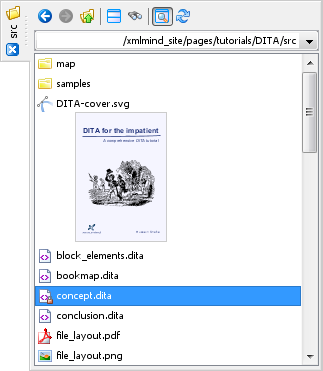 Notice in the above screenshot that the "Show image thumbnails" option (see below) is turned on and that the icon next to "concept.dita" has a small lock, meaning that is file is currently locked. Browse previously visited folder by undoing the Back action. Split the "Browse Files" tool in two parts, making it easy to drag/drop or to copy/paste files between these tools. Open a "Search Files" tool allowing to search by their contents the XML files found in this folder. This checkbox adds a thumbnail after each list item corresponding an image file. This facility makes use of all the image toolkit plug-ins currently installed in XXE. If you are missing an image format (e.g. SVG), please install the corresponding image toolkit plug-in (e.g. "Apache Batik image toolkit plug-in") using Options → Install Add-ons. Update what is displayed by the "Browse Files" tool. Clicking this button is needed when the content of the folder is modified outside XMLmind XML Editor. Up, Down, Shift+Up, Shift+Down may used to select one or more files. These shortcuts work as expected in any multi-selection list. Press Enter to open the selected file. If the selected file is an XML file, it is opened in XXE. If the selected file is not an XML file, a dialog box is displayed allowing the user to choose a helper application. Press Shift+Enter to open selected XML file in read-only mode. Click, Shift+Click, Ctrl+Click may used to select one or more files. These actions work as expected in any multi-selection list. Double-click on a file to open it. If the selected file is an XML file, it is opened in XXE. If the selected file is not an XML file, a dialog box is displayed allowing the user to choose a helper application. Open the selected file. If the selected file is an XML file, it is opened in XXE. If the selected file is not an XML file, a dialog box is displayed allowing the user to choose a helper application. Same as above, but the document is opened in read-only mode. Open a new "Browse Files" tool showing the contents of selected Zip archive. Enabled only if the selected file is a Zip archive of any known kind (.zip, .jar, .epub, .docx, .xlsx, .odt, etc). Note that the "Browse Files" does not allow to modify the contents of a Zip archive. For example, double-clicking on a XML file found in a Zip archive automatically opens this file in XXE in read-only mode. Create a subfolder in current folder. Create an XML file using the same dialog box as the one displayed by File → New. If the current folder is stored on a WebDAV server, it is also possible to lock a subfolder of the current folder. In principle, the file must have been locked by you. However, this menu item will attempt to unlock it in all cases and depending on your privileges, this action may succeed or fail. Paste files cut or copied using the above menu items. This menu item is present only when the underlying storage facility supports file versioning (e.g. Google Drive™). More information in Section 7.1, “Opening and comparing revisions of a document”. The customary keyboard shortcuts Ctrl+A, Ctrl+X, Ctrl+C, Ctrl+V, Del, Backspace work as expected in any file manager. The "Browse Files" tool is fully drag and drop enabled. It supports the copy and move operations. It does not support the link operation. Note that when an XML file is dragged and dropped onto XXE, the document is always opened or reopened in XXE. 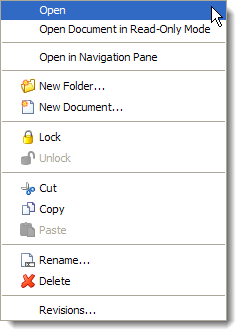 Details about the lock are given by the tooltip of the file icon.